Radiant heat barriers are materials installed in a house to prevent the summer heat seeping into the house or to prevent the inside heat from escaping in winter through thermal radiation. They also help in reducing heat loss in winter. An effective radiant heat barrier can reduce cooling costs from 5% to 25%. Radiant heat is absorbed by most materials. Once absorbed, the temperature of this material rises until the material itself starts to emit heat. The role of a radiant barrier is to reduce the heat transfer from the attic roof to the insulation, which is on the attic floor / ceiling. It reduces the amount of heat radiated across the air space adjacent to the radiant barrier. These barriers are more effective when used in hot climates. 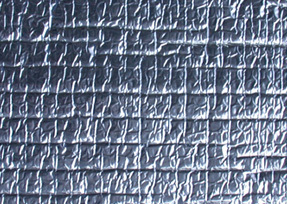 A radiant barrier usually has a shiny reflecting surface like aluminum, which reflects heat. Usually, radiant barriers are made of number of substrate layers above and behind which there is a thin layer of aluminum. Some of the commonly used substrate materials include plastic films, kraft paper, plywood sheathing, cardboard, and air infiltration barrier material. Radiant barriers are usually placed in the attic of houses as that is where they are needed the most to prevent heat seepage or loss into the insulation. A unique characteristic of materials that reflect radiant heat is that they do not emit radiant heat when they are heated i.e. such barriers have high rates of reflectivity and low rates of emissivity. Both emissivity rating and reflectivity ratings of a radiant barrier can range between 0 and 1. An un-perforated radiant barrier has an emissivity rating of 0.03 to 0.05. The easiest way to install a radiant barrier is to place it over the existing insulation with the shiny side placed up. The problem with this is, though it is effective initially, later on as dust collects on the radiant barrier the efficiency level decreases. If the radiant barrier is placed on top of the ceiling installation then it is likely to trap moisture in the insulation, which will in turn damage the insulation. The advantage of this installation is that it is not only easy to do, but it is effective in ensuring that heat does not escape from the living quarters below during winter. Radiant barriers that are placed on attic floors are perforated to allow water vapor to pass through it. Another alternative to perforations is to use substrates that allow for the passage of water. For a radiant barrier to work effectively it needs to face an air space. There should be at least 1-inch deep air space in order to work. If the radiant barrier is placed directly against another material with no air space, it eliminates any possible energy savings. Ideally, heat should strike the radiant heat barrier at a right angle for it to work effectively.